(Photo: Ecumenical News / Peter Kenny)Lutheran World Federation General Secretary, Rev. 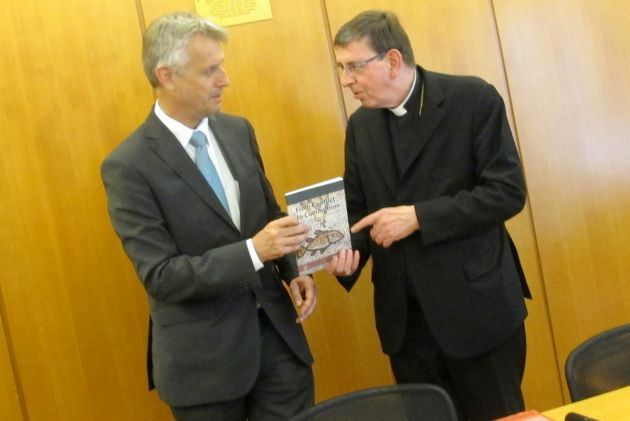 Martin Junge and Cardinal Kurt Koch, President of the Pontifical Council for Promoting Christian Unity, with the shared Catholic-Lutheran publication on the Reformaton, From Conflict to Communion, in Geneva on June 17, 2013. Catholics and Lutherans are urging their congregations to jointly discuss a co-publication entitled From Conflict to Communion as this helps bury past differences and brings the two Christian traditions closer together. The full title of the document is, "From Conflict to Communion. Lutheran-Catholic Common Commemoration of the Reformation in 2017." In a joint letter The Lutheran World Federation (LWF) along with with the Pontifical Council for Promoting Christian Unity (PCPCU) recommends the publication "From Conflict to Communion." Events in Christianity that led to the Reformation nearly half a millennium ago split the Roman Catholic Church, ushering the advent of Protestant churches. When the 500th anniversary of the Reformation is commemorated in 2017, Lutherans and Catholics hope to be drawn closer in the quest for church unity. "From Conflict to Communion is the first-ever attempt at an international level jointly to describe the history of the Reformation," reads the letter to member churches signed by Cardinal Kurt Koch who heads the Catholic Council and LWF general secretary, Rev. Martin Junge. There are around 1.2 billion Catholics in the world while the Lutheran World Federation has some 70 million members in its churches. A letter signed by Kock and Junge is being circulated to Lutheran and Catholic congregation exhorting them to study the document, the Lutheran World Federation reports on its website. "I look with a sense of profound gratitude to Jesus Christ, at the many steps that have been taken in the relations between Lutherans and Catholics in recent decades," said Pope Francis when he received a delegation of the Lutheran World Federation and representatives from the Lutheran-Roman Catholic International Commission on Unity on October 21. It is "not only through theological dialogue but also by means of brotherly collaboration in many pastoral fields and, above all, in commitment to progress in spiritual ecumenism," said Francis. The joint document seeks, "to analyze the theological issues at stake, to trace ecumenical developments between our communions and to identify where convergence has been achieved and where differences remain." Rev. Kaisamari Hintikka, the LWF assistant general secretary for ecumenical relations, encouraged member churches to discuss the document on regional and local levels. 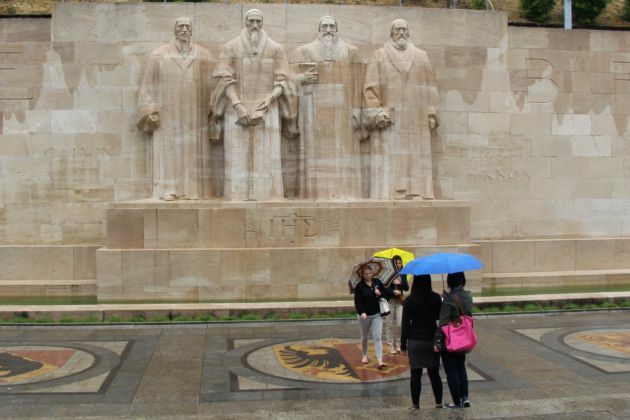 (Photo: Ecumenical News / Peter Kenny)The Reformation Monument in Geneva on May 31, 2013. "Even though ecumenical dialogues have been considered as important part of the mission of the churches and the reports of these dialogues have been often received with great expectations, the actual reception process of the documents has been left for lesser attention," Hintikka said. Although the document might seem directed towards a theologically trained audience of theologians, parts such as the ecumenical imperatives at the end of the document could be widely used, she said. Hintikka noted that in North and Latin America or in Europe where Lutherans and Catholics together have already translated the document and started discussions on it within their local communities. "We hope to encourage the Catholic and Lutheran communities to come together and study this document," to deepen their relationship "and strengthen their joint witness," Hintikka said. When the document is studied, it should be done together with Catholics and Lutherans, she said. At the time of the signing of the join document in June 2013, LWF President Bishop Munib A. Younan noted in a speech, "It is my sense that this document can be an important tool in improving relationships and, more importantly, common witness, in all contexts." He said, "We seek unity, not because it simply is a good idea, but because it is the desire of Jesus, grounded in his commandment of love." The event that is considered to have triggered the Reformation was the writing in 1517 by Martin Luther of the document known as "The Ninety-Five Theses on the Power and Efficacy of Indulgences." The Ninety-Five Theses, as it is now known protested against clerical abuses in the Church of Rome, especially the sale of indulgences which were considered to speed up the process by which Christians who had sinned could get to heaven. The Protestant Reformation creating the schism within Western Christianity was also led by John Wycliffe, Jan Hus, John Calvin, John Knox and other early Protestants. International and civil wars were fought in the centuries that followed between Catholic and Protestant European nations, often on the pretext of faith. The Lutheran-Roman Catholic Joint Commission made up of people approved by the Vatican and the LWF offers five "ecumenical imperatives" intended to help Catholics and Lutherans into their new era of dialogue. The first imperative is: "Catholics and Lutherans should always begin from the perspective of unity and not from the point of view of division in order to strengthen what is held in common even though the differences are more easily seen and experienced."